Rodney Thompson - Tabletop Games Manager at Wizards of the Coast - talks about The Legend of Drizzt. Maybe I’ve been spoiled by playing Mage Knight first, but Legend of Drizzt just seemed to lack a lot of choices and strategy. Playing solo and with my daughter, it just felt like we did the same thing each turn. “move, explore, place monster” or “attack, move, explore, place monster”. The only real choices came from deciding if I wanted to use a treasure card, daily, or utility power at “tougher” times. Difficulty only comes from the randomness, both in cards drawn and die rolls. A few unlucky rolls in a row, can pretty much lose the game for you. The components, however, are of nice quality. The miniatures are plentiful, as are the cards and tiles. There are a bunch of cardboard markers/chits as well. Almost TOO many pieces for such a quick and more simplified game. Setup for the last game played with my daughter took about 15 minutes. Finding specific tiles, shuffling cavern tiles (a bit difficult, imo), shuffling cards, choosing daily and utility powers, all seemed to take a bit more time and effort than what I felt the/game ultimately delivered – about 45 minutes to an hour of random battles. There is little variety to what you do, as well. As I mentioned earlier, you move a pre-determined amount of squares. If you end on a tiles edge, you can explore. You always draw a new monster, and sometimes you also get an “encounter” (bad thing happens, roll usually to see if it hits). And that’s the game. While I was mostly bored with it however, my daughter (age 7) very much enjoyed it. The fairly simple game mechanics are very easy to learn, and there was almost no need for “rule checking” during games. Playing co-op gives the opportunity for coordinating actions and attacks (as well as choosing starting cards for best “combos”). I would say the main benefits are co-op play, simplified mechanics make it easier to intoduce to younger/newer gamers, and the components. I even found the theme aspect somewhat lacking, because of the repetitive nature of the game, and the “samey” feeling of encounters and gameplay. It should be noted, we started off WITH the advanced deck added in. I didn’t feel the basic deck offered any choices or anything. We restarted and opened the advanced deck, which at least offered more ability choices and some tougher encounters/monsters. I would play this game with my daughter, and possibly others if they really wanted, but I wouldn’t choose a game of it. I would also never play this game with just the basic deck. NOTE: I borrowed Legend of Drizzt from a friend of mine for approx. 3 weeks, and played it numerous times with my daughter (as well as solo). The game we actually own (NOT listed here on BG.com for some reason) is Wrath of Ashardalon. My daughter had me rush out and buy her Wrath of Ashardalon with her birthday money. ASHARDALON IS MUCH MORE DIFFICULT. It’s also a good bit more bland with the tile sets, not that I felt that Drizzt’s tiles were anything superb. They are “functional”, and that’s about it. Some outdoor/indoor tiles or a way to improve on the tile-laying portion would be very welcome. One thing that bothered me with Drizzt, and came out even worse in Ashardalon, was the way everything was driven by dice rolls. Pull an event, roll a die. Regardless of statistics/probability, it always seems to me to be about a 30 percent chance of me making a good roll. Draw a monster every tile, monster immediately attacks, bad roll = damage. I seriously rolled nothing but 3’s (a few times!) and a 4 and 5, all in my first few rolls. Not fun. Even after using Mirror Image to boost my AC, I STILL Was rolling so horribly that monsters were hitting me! All of the high rolls were going to the monsters (16-20 on rolls), while I wasn’t rolling over a 5. There are VERY FEW ways to mitigate this, especially early on. In a recent game of Ashardalon, my daughter and I both tried the solo campaign. I played the Dragonborn Mage, and on my first monster draw, got the Devils that spawn 2 other devils with him. I was immediately surrounded by 3 devils, each hit me due to bad rolls. After losing 3 hp, the only thing I could really do was to run away, and try to clear 2 tiles. The only other option, was use my daily power (which I did) and kill all 3 of them. Now that power is gone, most likely for the remainder of the game. So I felt no sense of satisfaction, only more of a sense of futility. There was no chance to heal (unless you die and use a healing surge), nor any chance to reset my powers (not sure how many cards in the treasure deck flip power cards, but I didn’t gain ONE, and I had almost gotten to the last tile before I died again, with one surge left. Instead of surging and continuing on, I quit and went to play The aMAZEing Labyrinth with the family). Obviously Ashardalon wants players to use a full party, Cleric, tank, and wizard, to be able to survive the encounters via any “strategy”. However, due to the fact that healing surges are shared, if one person gets stuck in a bad roll, or a bunch of tiles with black triangles appear causing some horrendous events, the game is over pretty quickly. This wouldn’t be so bad, if the game didn’t require so much setup. There are literally hundreds of cardboard chits, tiles, cards, and miniatures to deal with and sort before the game even begins. To go through all of that, and lose from a die roll, doesn’t interest me. And I like dice games! But not ones that require 15-20 minutes of setup, just to lose horribly in 15-20 minutes. No one has ever wanted to set it back up, even after WINNING a game. One game is enough, win or lose, before it’s all packed back up. On the flipside, games like Last Night on Earth set up a bit faster, have more engaging play (and still rely on the dice), but for some reason they just seem more FUN. That game gets requests for another round usually. Mage Knight, even though I play solo, still requires about 15 minutes of setup, but then it’s a 1-2 hour game. NEvermind if I only take down one city in solo conquest before I run out of time, it still is a BLAST to play, and is very engaging. It still has some random elements, but it doesn’t seem to make the entire rest of the game seem POINTLESS. When I play Ashardalon, and on occasion even Drizzt, I felt like it was just an excercise in rolling a die. I never feel immersed, I never feel like I am making many choices or doing much planning. I’m just moving, and rolling a die. I just cannot recommend the D&D Adventure System games, for this reason. To be perfectly honest, though, it’s the same issue I have with tabletop roleplaying. A bad night with the dice from one person, can sometimes ruin it for everyone. I only play Pathfinder, for the social/story/interaction aspects. I honestly dislike the dice rolling to an extent, but no where NEAR as much as I dislike it in the D&D Adventure System games. Bottom Line Up Front: Yes, the game has its design flaws. Despite this, my family keeps coming back and repeatedly has great experiences. It is a cooperative dungeon crawl and everyone is in the hero party (no one needs to exclusively control the “bad guys” as I understand is required in Descent, Doom, Super Dungeon Explore, etc). Components: Top notch. It comes in a big, heavy box filled with high quality components and impressive miniatures. The 40(42?) minis are plastics from a previous D&D line(most are great sculpts, some are simply “good”), very sturdy interlocking dungeon floor tiles, 200 cards, rule book + scenario book, and piles of tokens/chits/cardboard pieces (many used rarely/sparingly to support a specific scenario). It’s very hard to nitpick with components. If I had to pick flaws: books are a little thin/flimsy (but within industry standard) and books could use some additional Drizzt theme artwork to help establish feel. MSRP of $64.99 seems very reasonable, though it can be found for substantially less online. Gameplay: A player’s turn consists of three phases. In “Hero Phase” the current player generally attacks then moves, or he moves then attacks. An “Explore Phase” allows a hero on an unexplored edge of a floor tile to draw and place a new tile on the edge, expanding the dungeon. A monster is drawn and placed on the new tile’s designated area and is controlled by this player. In “Villain Phase” the player draws and plays encounter cards (only if no new tile was placed or tile had a black arrow). Encounters are bad things, generally, like additional monsters, explosions, poisons, etc. The current player then moves and attacks with monsters in his control according to the AI printed on the respective cards (monsters can attack any player but are controlled by one). Next player… This more or less continues (with the expected variants and exceptions depicted on Encounter and Monster cards) until a key tile is drawn triggering some big boss showdown, desired item to retrieve, or other victory criteria. As you might expect it is frowned upon to have your characters die. There are a number of different scenarios provided to keep things fresh. Players select characters from RA Salvatore’s fiction to use. You get different abilities to pick from; some can be used as much as you want, some saved for special occasions. Defeating monsters will earn treasure and items ranging from possibly useful to very powerful. Attacks are determined by rolling a 20-sided die, adding modifiers specific to the creature/player ability and subtracting specified armor class. Damage is set (no other dice used). The monsters keep coming, but one or two hits usually defeat them (but there are a few heavyweights…). It’s generally the quantity and the negative encounters that stack up against you. The game is not perfect. There are plenty of instances where encounter or monster text isn’t clear. There are moments, however rare, of confusion and the need for a “judgment call”. Often it’s as simple as a monster is equidistant from two players: who does he attack? Do we pick what is advantageous to the party? To the Monster? Flip a coin? In the spirit of this game, these flaws did not really detract from the experience. In some ways it fits the D&D theme (the decisive DM in me since childhood comes out and we move on continuing the fun). But I realize there are board gamers who prize games for their elegance, purity, and flawlessness of mechanics. I like the gameplay. It works. But it sometimes feels less like flowing poetry and more like a locomotive fully capable of crushing occasional debris on the tracks. Solo play: It is listed as for 1-5 players. While the guide provides a solo adventure and more could be developed, I do not feel that it is that much fun. I viewed this as a tool to familiarize myself with the mechanics before teaching the kids. I hesitate to recommend this to someone looking for a solitaire experience (though painting the minis was a very satisfying way to appreciate the game solo for me). 4) you’d enjoy a quick D&D feeling experience but you haven’t had time to make a character since you were a freshman in high school. 2) a lot of moving parts; be prepared to nudge the experience forward occasionally. My family’s has had a lot of fun with this. I feel the game warranted my rating, which I suspect is above online gaming community norm. I hope this info and discussion of the games quirks can help you decide if this could be a fit for you as well. I also thought this game was enough of a value that I purchased the two companion games in the D&D Adventure System line; “Ravenloft” and “Ashardalon”. I bought this game as I’m an old D&D’er (pen and paper rpg) and it was either this game og the Dungeon Command series. So I went with this since it had (from looking on reviews); 1. a “know” story, 2. improved mechanics since Castle Ravenloft, 3. more replayability and more interesting mechanics than Dungeon Command(?). Now, I’ve only read the first 3 books with Drizzt (when he comes out of the underdark) so I’m not familiar with all the characters included in this game, other than that i know them by name. As I first mentioned I’m an old D&D’er and have spent a lot of time in Faerun (the universe which this game is based on) from 2nd to 3.5 edition. When 4th edition was released I was really disappointed. All the flexibility in the classes was removed to make all classes do basically the same stuff but with different flavor texts. And Legends of Drizzt is basically a simplyfied 4th edition. I’ll give it plusses for good quality and a game that’s tied to some of the great novels TSR/WotC have published in the last few decades. But that’s about it, unfortunately. You’ll find that the real threat of the game is the encounter cards and not the monsters you battle. The turn order doesn’t make sense as you’ll be surprised every time you discover a new tile and thereby meet a new enemy which then gets an attack on you before you can do anything. Because of the simle mechanics (move/fight, explore, encountercards/get attacked) this is a very repetative game, and the different stories are not introducing new twist for that specific mission. I will play this game again to make the game worth it’s money, but I wont play it untill I’ve cooked together some variant rules that actually makes sense, so that I can experience the story of the game rather than focusing on the terrible mechanics. If you are looking for a game – don’t buy this! If you are like Drizzt and his adventures – don’t buy this! If you have played D&D (or Pathfinder) before – don’t buy this! 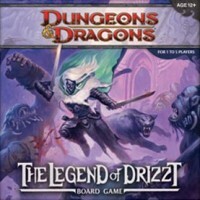 The legend of Drizzt board game, is an adventure, scenario based dungeon crawling board game based on D&D rule, based on NY times best selling author, R.A Salvatore’s beloved novel series, the legend of Drizzt. The game components are robust and beautiful. The game play is easy to learn. The modular tiled design of the game board offers a a variety of replay value (because most of times the dungeons will be different every time you play). The scenarios are interesting, allowing players to relive some of the key moments from Drizzt novels. The heroes in this game are the main selling point of this game, every hero has different skills and strength. This means the player has to approach the game with different tactics depending on which hero he/she is using. Overall, this is a solid dungeon crawling game. Even if you have never read any of the Drizzt novels, the game is still a blast to play. If you are a fan of Drizzt, then you will love this game! This is the best one and tehn Castle Ravenloft and then the one with the dragon is last. Drizzt! Drizzt! Drizzt! Drizzt! Drizzt! Drizzt! Drizzt! Drizzt! Drizzt! Drizzt! Drizzt! Drizzt! Drizzt! Drizzt! Drizzt! Drizzt! Drizzt! Drizzt! Drizzt! ! Drizzt! 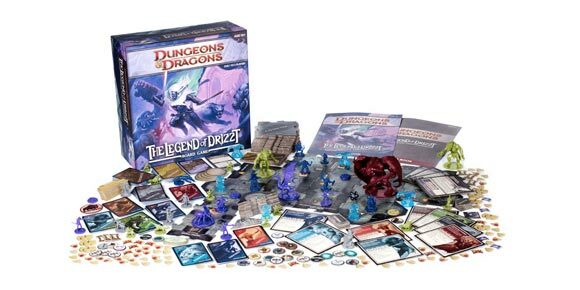 Add a Review for "Dungeons & Dragons: The Legend of Drizzt Board Game"